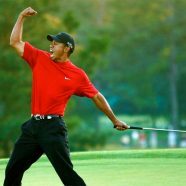 2005 – Tiger Woods wins his fourth Masters Golf Tournament at Augusta National Golf Club. Woods birdied the the first hole of the sudden-death playoff against Chris DiMarco with a 15-foot putt. It was the fourth time Woods donned the green jacket awarded to the winner of the Masters and it was his ninth major championship on the PGA tour. Wood won his first Masters championship at the age of 21, shooting an 18-under par. He would go on to win the tournament in in 2001 and 2002.